HCM CITY — Saigon Co.op said its retail systems, including Co.opmart, Co.opXtra, Co.op Food, and Co.opSmile and Cheers, successfully managed to serve a large number of customers during the Tết (Lunar New Year) holidays thanks to careful preparations. Speaking at a meeting with city leaders in HCM City on February 11, Nguyễn Anh Đức, permanent deputy general director of Saigon Co.op, said the retailer had fulfilled its commitments to consumers and city leaders about issues such as ensuring an adequate supply of goods, including price-stabilised goods, keeping prices unchanged and ensuring food safety and hygiene. 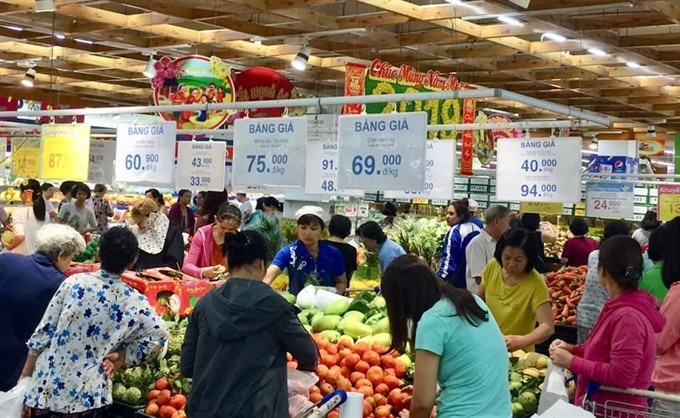 The number of customers at Co.opmart, Co.opXtra, Co.op Food, and Co.opSmile and Cheers went up sharply, especially in the four weeks before Tết when they received four times the number of shoppers as normal. In the eight weeks before Tết, their revenues reached a record nearly VNĐ8 trillion (US$344.06 million). They had abundant supply of Tết products at competitive prices and offered a number of promotions, and their home ordering and delivery services and ready-to-eat dishes for Tết were greatly appreciated by customers, he said. Saigon Co.op had given more than 10,000 Tết gifts to disadvantage households. Lê Thanh Liêm, vice chairman of the city People’s Committee, hailed the efforts made by Saigon Co.op’s management and employees to serve customers during the year’s biggest festival.